How liberals got the Electoral College so wrong. They never should have promoted it as democracy’s savior. Photo illustration by Slate. Photos by Mark Makela/Getty Images and engraving by E. Prud’homme from miniature by Arch. Robertson. A strange thing happened in the weeks between the presidential election and Monday’s meetings of the electors who have now anointed Donald Trump as our 45th president: A bunch of liberals fell back in love with the Electoral College. Harvard Law professor Lawrence Lessig led the charge with his attempt to convince electors that Donald Trump should not become president. Lessig argued that the Electoral College was “meant to be a circuit breaker—just in case the people go crazy,” and that Trump’s many flaws, combined with his large popular vote loss, should compel electors to vote for Hillary Clinton instead of the man who won the most votes in the Electoral College. 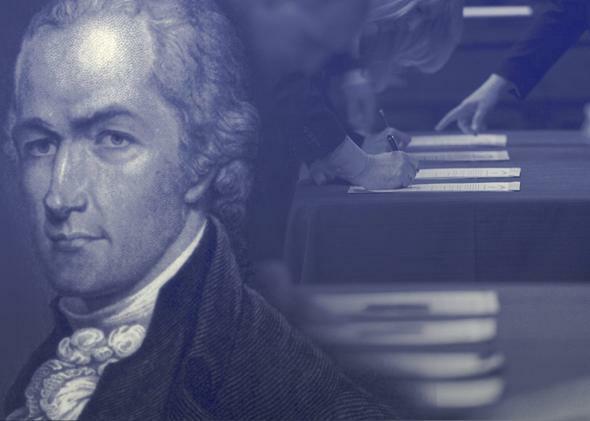 Progressives also rallied around these so-called Hamilton electors, citing Alexander Hamilton’s “Federalist No. 68,” to argue that the Electoral College was designed to thwart the exact type of demagogue we will now have as president. Key to this reasoning was Hamilton’s proclamation that the college could reject candidates under the influence of “foreign powers.” Sound familiar? These arguments may seem plausible. But in reality, they are specious, ahistorical, and counterproductive. The Electoral College is not a safety valve meant to prevent the election of demagogues and Manchurian candidates, nor is it a deliberative body whose collective intelligence guides it toward a sage decision. It is an anachronism, a deeply undemocratic product of a compromise with slave states that serves no real purpose today. The only real role of the Electoral College is to dilute the votes of American citizens who happen to live in larger states and who are these days disproportionately Asian and Latino. Unless liberals want to defend that, they should stop pretending the Electoral College provides any benefit to our modern democracy and devote their energy to abolishing it altogether. The progressive arguments in favor of the college come almost entirely from “Federalist No. 68,” which is itself a huge red flag. The Federalist Papers are an undoubtedly useful tool for interpreting the intent of the individuals who drafted the Constitution. But they are also political propaganda designed to sell the Constitution to the men charged with ratifying or rejecting it. They are, in effect, an advertisement—and like many advertisements, they play a bit loose with the truth. Some of the Federalist Papers, such as the oft-cited “No. 78,” present an honest, straightforward framework for interpreting constitutional structures. But others attempt to paper over the Constitution’s flawed bargains by dressing up a dubious trade-off as a feat of democratic brilliance. “Federalist No. 68” falls into this latter category. Hamilton framed the Electoral College as a tyrant-thwarting safety valve because the reality is infinitely less palatable: The college was simply a sop to slave states that craved influence in the newly powerful federal government. As James Madison wrote in his account of the Constitutional Convention, slave states were concerned that the direct election of a president would diminish their sway in federal affairs. Why? Because a huge proportion of most slave states—enslaved people—were unable to vote. Slave states had crafted one work-around for this issue by pushing through the Three-Fifths Clause, which counted slaves as three-fifths of a person for the purposes of apportioning seats in the House of Representatives. But a popular vote of the president—based strictly on the population of white men who were allowed to vote—might prevent proslavery presidents from perpetually assuming control of the executive branch. As Madison explained, the solution to this concern was the Electoral College. The Constitution apportioned electors based on the number of senators and representatives a state had. Each state got two senators regardless of population, but the number of representatives a state received depended upon its population. And since slaves qualified as three-fifths of a person in counting a state’s population, slave states received extra representatives—which translated into extra electors. Through this constitutional calculus, slave states were able to maintain their grasp on the presidency for decades. As for Hamilton’s notion that the wise electors would judiciously deliberate and choose the most qualified candidate? It’s utterly irrelevant today, since most states bind electors to their state’s popular vote. Some progressives have filed lawsuits to free electors from these laws and allow them to “vote their conscience,” a shamefully anti-democratic and myopic rationalization. More than 100 million people vote in each presidential election. Why should electors—mostly party loyalists with no notable qualifications for choosing a commander-in-chief—be able to nullify these votes? What gives them the right to toss out the democratic choice of the people in their individual states and pick their favorite candidate instead? But wait, the counterargument goes, Clinton won more votes than Trump. Shouldn’t electors be able to vote for the candidate who won the popular vote? Yes, they should be, and if enough states pass the National Popular Vote Interstate Compact, they will be obligated to do so. This agreement would bind states’ electors to the winner of the popular vote; it would take effect the moment enough states—those whose electoral votes total 270—have passed it. The NPVIC is a precise, rational tool to address the Electoral College’s obsolescence. The fight to free electors from voting for their state’s popular vote winner is ad hoc silliness and a recipe for future disaster. In the end, these liberal schemes to try to deny Trump the presidency only made sense if you assumed as a starting point that America would never hold another presidential election. They were all tailored to our current crisis and lack even an iota of foresight. A move to make the Electoral College a deliberative body would render our presidential elections undemocratic. An invalidation of winner-take-all electoral vote allocations would also favor Republicans, who have long sought to carve up purple states to deprive Democrats of electoral votes. And maybe worst of all, this endless chatter about the genius of the Electoral College preserves Hamilton’s fantasy at a time when Americans should be waking up to the system’s unjustifiable absurdities and origins. Progressives never should have used Trump’s election as an opportunity to try to make the Electoral College America’s savior. They should have used it—and can still cite it—as an excellent example of the system’s absolute failure to serve any positive purpose in modern American democracy.